Oh, sure, blame it on the crackhead. related: So if I start selling drugs I can drive an Escalade, too? With a fucked up font like that, do you blame me? Yes. It’s not the font (or the kerning), it’s your eyes. 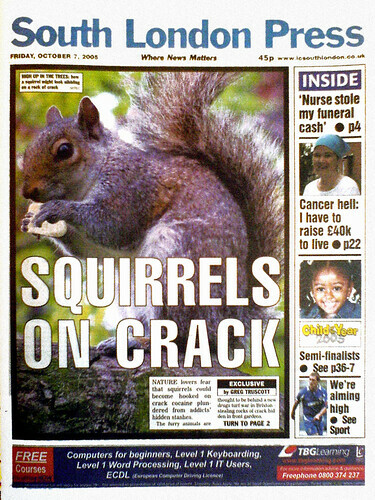 Go back and replace “crackhead” with “squirrel” in the notes for extra laughs. Yes, when you least expect it! That’s the most foul, cruel, and bad-tempered rodent you ever set eyes on! why would a crackhead leave their beer? Because he forgot it. Come on, man. It was a gateway Beer. The crackhead traded up. 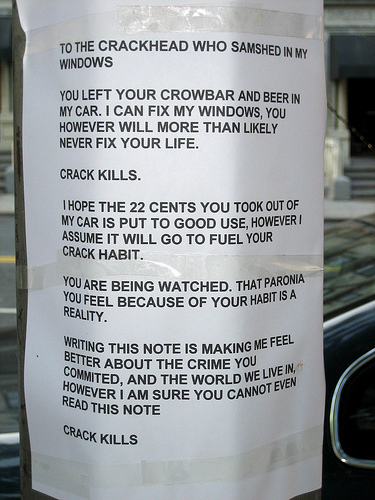 The crackhead probably can spell paranoia. 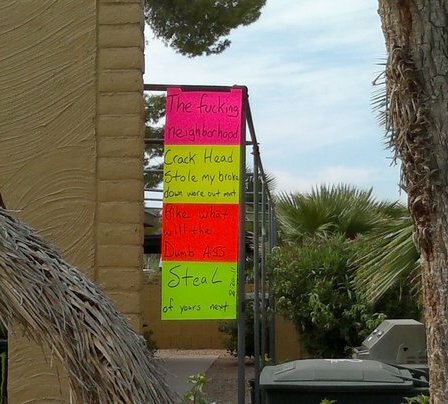 Based on the spelling on that first sign, I think this was an example of crackhead on crackhead thievery. Is anyone else worried about those squirrels in London? They could get mean if they need a fix! I would totally steal Ohio’s sign. 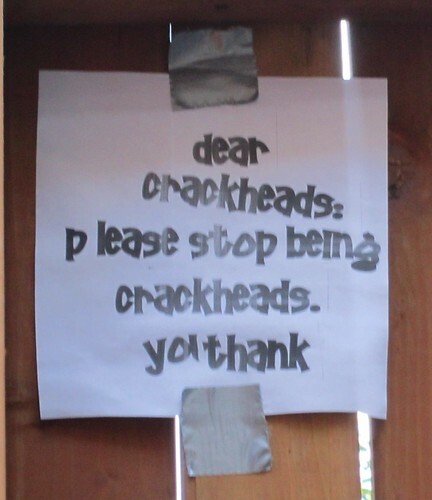 if you write a sign that goes off on crackheads for doing something that you think that a crackhead did but you can’t spell correctly, you’re probably a crackhead. Do “normies” know that crack makes you impotent and paranoid or do some of these people have personal experience? I guess some do. I think a lot of people know that crack makes you paranoid. but probably less know about the decreased sexual function. I didn’t know until I had a few experiences with opiates- which I think decreases function more than crack. …. Actually if you imagine the Power Rangers all hopped up on drugs, it makes a lot more sense. Go go Power Rangers! Will no one think of the meth? That’s exactly what I thought of when I saw “Pueblo, Colorado”. I think if you switch “crackheads” with “the blacks” in these you can see what these people are really trying to say. Well, with black populations of roughly 28, 8, 16, 2.5, 8 and 10.5 percent respectively in those cities, it’s much more likely the perpetrators were on meth. 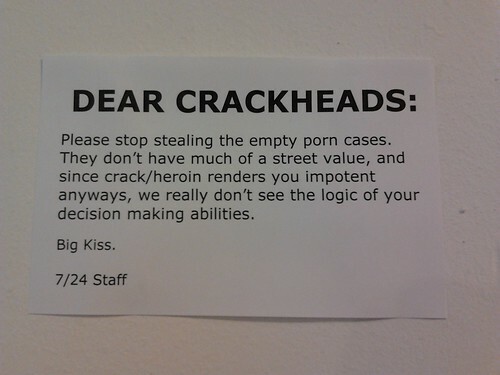 Now if you switch “crackheads” to “meth-heads”, what are they trying to say then? That this area would be a great spot for a new dentist/rehab facility? In general, if the crackheads in the neighborhood are black, the people trying to deal with the relentless ‘night of the living crackhead’ theft, vandalism and general insane behavior are also black. 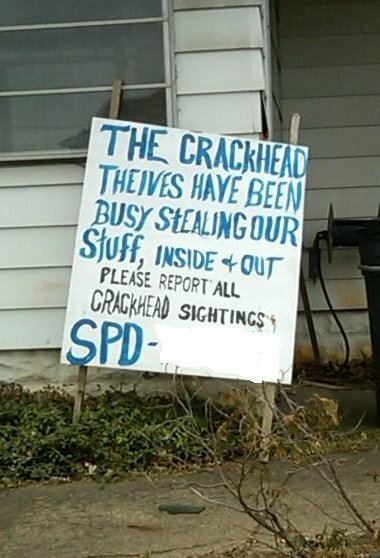 So no, I think they mean ‘crackheads’. Lately he’s been going ’round the pawnshops. saw him with a crackpipe down at trader vic’s…. it’s really hard to get samshed out of car windows, so I can feel the pain in NYC. Hail, hail Paronia! Land of the brave and free…! Why would anyone complain about free beer? Hell, my insurance will cover a new car window, and I can’t sweat about a premium increase while I’m drinking free beer. 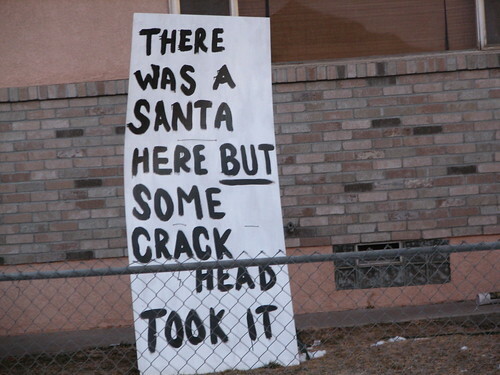 Let’s get real…there’s no such thing as a “crackhead sighting”. Those suckers are much too fast to be sighted. ‘Why they’ll slip the laces out of your shoes while you’re in mid stride!! You’d need a high-speed camera set up by Urban Wild Kingdom to gain a glimpse of one in its natural habitat. Can this particular meme die already? Please? At least the others are tangetially related, this is just idiotic. STEPHEN ROOT IS A KLINGON!!! You so walked into that, Elf. I think the New York note writer is the winner here. I wonder if he/she knows a good window samshing service. If you want to do crack, pull down your pants. Not only does it appear that the Seattle note is done in a 60′s comedy font*, it even looks like it could have made a decent movie title considering the times. So proud to call Akron home. Oh, and they don’t call it “Cr-akron” for nuthin! This makes me sad, and it also makes me laugh like a hyena. I want to know what the other 17/24 of the staff think of the crackheads on heroin taking video cases. To the person who wrote and posted the sign from New York, LEARN TO SPELL. You do know that the people you’re yelling at can’t actually hear you, when you shout messages into the computer? …Right, melissa?